Heather was wearing the wrong dress. It had seemed like a good idea in the morning - it was a tight little black thing; she'd looked fantastic in the mirror - but now she was thinking that she should have worn something more demure. This was a foolish dress to meet your intellectual hero in. Waiting in the coffee shop for the great man to arrive, Heather was squirming with nervousness, and she began to wonder why she was here - why she had gone to such lengths to meet this man, when she knew he couldn't possibly be as interesting in person as he was in his books. She had a wild urge to flee - to scribble a note of apology, leave it with the waiter, and drive all the way back to Providence. But she stayed where she was. She was nervous; she was a little scared; but she could live with that. Fear of any undertaking, to her way of thinking, was usually a reason to go ahead with it. They had never met, but he picked her out instantly, and he came toward her, smiling. Old, fat, bald, leaning awkwardly on a cane. The man of her dreams. This is actually the entire first chapter of Brian Morton's 1998 novel, and the second of his books I have picked up in as many weeks. 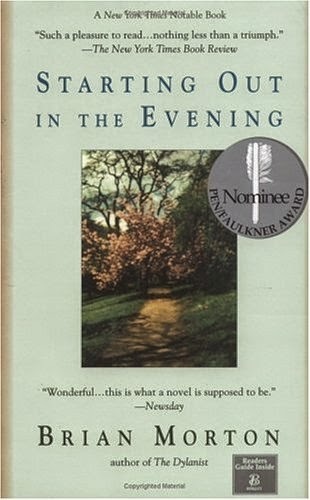 I loved his most recent novel, Florence Gordon, and started reading this one just a few days later. I'm only 50 pages in, but love the writing and am enjoying getting to know the three main characters. I think this will be another winner. In beautifully nuanced scenes, Heather Wolfe, a 24-year-old graduate student, forces a meeting with broken-down Leonard Schiller, an out-of-print, sick old writer whose early works, written during the heyday of 1940s and 1950s New York intellectualism, forever changed Heather's life. Targeted as the subject of Heather's master's thesis, Schiller quickly falls under the seductive promise of her admiration, much to the distress of Ariel, his 39-year-old daughter, whose own struggles with failed romance and childlessness derail her energy. Morton demonstrates an astonishingly sensitive appreciation for his characters as he reveals with unnerving accuracy the most private thoughts not only of his women but of the dying old man as well. These mismatched souls gradually realize that their individual journeys, which they thought were drawing to a close, are in fact new beginnings. Morton's respect for his characters and his audience is a quiet literary triumph. Highly recommended. What do you think of the first chapter? Would you keep reading? This sounds wonderful JoAnn. I hope you enjoy it. Pat - It's great so far. What the heck?? Talk about a shocker for that poor girl. I love it! Diane - This intro was too good not to share! You have my interest! I'd keep reading. Yvonne - Can't wait to get back to it tonight. I have bookmarked Florence Gordon, as I loved what I've read about it. In this opener, the author captures the character's feeling of intensity and anxiety as she waits...and then the meeting seems so vivid as well. Thanks for sharing...adding this one to my list. Laurel-Rain Snow - I really love the way Morton develops his characters... a wonderful writer! Monica - Morton may be my author discovery of the year! Literary Feline - I'm wondering what kind of relationship they will have going forward. The synopsis makes me want to read this story, but the opening doesn't draw me in. That's probably because the author used the passive "was" in almost every sentence! (Sorry. My editing brain kicked in.) I do like the description of her first glimpse of the man coming in the door. Nice picture. Thank you for visiting my blog and leaving a comment about WAR BRIDES. Sandra - Interesting! I didn't even notice, but that is one of my daughter's pet peeves, too. I've read 2 glowing reviews of Florence Gordon and plan to read it before the end of the year. This one looks good too! Sarah - Strong character development is definitely this author's strength. I love the beginning. What a picture he paints! You can really see these characters. I'm not sure if the blurb would've grabbed me but I'll definitely be looking for your review of this one. Katherine - I can just see that big, furry, many-flapped hat, too! I need to read more literary novels such as these. Looks good! Oh certainly I need to read the rest. That is quite an anti-climax for the poor girl. Athira - There second chapter is just as short and just as good. What a lovely title! An author I've never heard of, never mind read. It sounds like a gap that will need to be filled. Audrey - Brin Morton may just be my author discovery of the year! I think this was the one that was turned into a movie! I definitely want to read it and heard great things about it even before I picked up Florence Gordon. Shannon - Oh, I didn't know it was a movie! Will try and find it when I'm done reading. Wonder why he is the man of her dreams. Nise' - He is an author and his books had a huge influence on her in her teens. Kelley - The second chapter is just as good! See my comment to Nise' above. Margot - It's an excellent book so far. Sounds interesting! Yes, I'd keep reading. I have seen Florence Gordon around, but I haven't heard of this one. Hope it's a great read for you. Leila - I think Morton's characters are his strength. Florence Gordon was excellent and I'm loving this one so far, too.